The author met and fell in love with Milena Jesenska, the Wild Cild of Prague, who helped to try and help as many of other inmates of the Ravensbruck concentration camp (near Vienna) to survive as possible, two truly remarkable women. The cover of this book is shown here as well as two videos dedicated to their relationship above and at the end of the article. 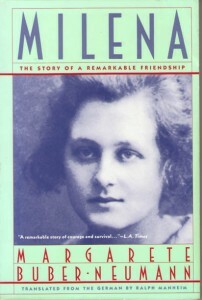 So Greta as Milena called her friend, tells the story in partial flashback from how Milena told her things in the camp and what she has meticulously researched, from her youth as the daughter of a prominent Dentist, going off the rails and taking Cocaine and all sorts of other drugs, while have the ability to bewitch and seduce all kinds of poets, writers and artists, including Kafka whose letters to Milena the book heavily quotes from. She spent a lot of time Partying with Franz, and it gives a very different insight in his work as well. Milena (1896-1944) was also a very good journalist, and it was through the honesty of her articles in saying the truth of which was happening that got her arrested after the Germans invaded Prague. She died in Ravensbruck 10 days before D-Day landings.